Setting up IP phones in your office requires identifying your budget, your expectations, and the size of your business. The types of IP phones that you purchase will largely depend on your call volume and how many lines you need to support. There are a wide range of IP phones available in the market for you to make your selection from. However, the task of narrowing down to the one choice that will not only be the perfect fit for your organization but also for your budget can be difficult to determine because many of them are so similar. This short list of IP phones is intended to help narrow down your search based on research and testing we’ve done in-house as well as feedback from our customers. In this article, we’ve selected three of the best small business IP phones that you can buy for under $75. Any one of these phones would be suitable for a small business. They all have key features like programmable keys, LCD display, multiple lines, conferencing, HD voice, and web configuration. So how do you decide? There are a few main differences that we’ve outlined in this table. If this isn’t enough for you to decide and you want to know more about our take on the look, feel, and usability of each one of these IP phones for a small business environment, read on. Overall, Grandstream has knack for designing IP phones that look and feel new. From the weight of the handset to the sleek buttons, this phone has a high-end feel. The GXP1625 is one of their lower end models compared to the GXP2100 series, which offers color display and more lines. Out of the three IP phones highlighted in this post, the Grandstream GXP1625 is the only one that comes with both PoE and a Power Supply. However minor, this means less cables, less work, and less cost for you. Many of our SMB customers find the GXP1625 a great entry-level phone for switching to a VoIP system, because it’s affordable and easy to set up without any technical support. You can order pre-configured Grandstream phones from the Telzio shop that arrive ready for calling, or you can follow our step-by-step Grandstream setup guides. 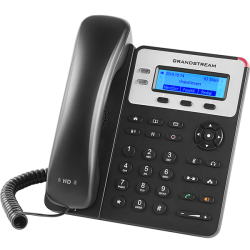 Over the years we’ve found Grandstream to have issues with firmware updates, which requires some users to adjust the preferred transport method setting on their IP phone. When the setting is not updated, this can cause the phone to go offline. 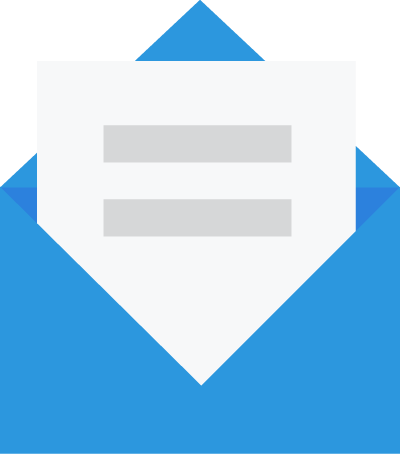 The user or administrator would need to log into the phone’s web interface and make one change to get the phone working again. If Grandstream can fix their firmware updates and continue to deliver the same quality and cost of their IP phones, there’s no reason not to choose this brand. 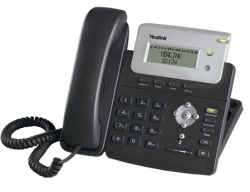 The name Yealink is the latest brand to become highly recognizable in the world of IP phones. Yealink is a Chinese company that is quickly becoming the #1 seller of IP phones in the world. Yealink continues to prove their phones can stand up to brands like Cisco and Grandstream in quality and design. The Yealink SIP-T21P is a great entry-level phone for small businesses, and comparable to the Grandstream GXP1625. Like the GXP1625, it has 2 lines and can support 2 users. One noticeable difference of Yealink compared to Grandstream is that the interface of the Yealink reacts much faster. The price point is affordable for small businesses and very competitive to Grandstream. The weight of the handset is lighter and some may feel that makes the phone feel “cheaper”. But this is subjective has no functional value. Yealink is quickly becoming a favorite brand of IP phones for small businesses because it works well without issues. It could have something to do with the fact that they have 200 engineers dedicated to making sure their software works seamlessly. The Yealink SIP-T21P is a solid choice over a Grandstream or Cisco phone for your small business if you need something straightforward that just works. Cisco is the most recognizable office phone in the US, being as they started back in 1984. 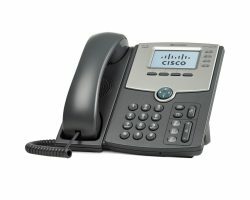 Being a PBX hardware maker, some of Cisco’s IP phones only work with their licensed-PBX systems. The Cisco SPA 303 is an IP phone that does not require a Cisco PBX system, and can be used with Telzio. The Cisco SPA 303 supports up to 3 lines, compared to 2 lines with the Grandstream and Yealink comps. This means you can have up to 3 active callers and switch between them using the buttons on the side of the display. The Cisco SPA 303 can only support 1 user, which won’t work if you need to manage 2 separate extensions or phone numbers from this phone. And, the phone doesn’t come with PoE or a Power Supply, so you’ll need to purchase that separately. If you’ve used a VoIP system before you may already have purchased Cisco phones and used them with a different provider. The good thing is you can still use those with Telzio, so you don’t need to purchase all new phones. We’re happy to help recommend the right type of phones for your business and budget – just write us at sales@telzio.com!